Companies and talent moving to Winnipeg thanks to our unique combination of work-life balance, affordability, diversified economy and connected business community. Photo by Mike Peters. People are feeling tired in Toronto, Vancouver, and other major Canadian markets. They’re tired of long commute times, high housing costs, unaffordable daycare rates, and scarce family time. This fatigue has ramifications for companies located in these cities – corporate burnout is increasing, productivity is declining, and job tenure is shrinking. Inter-company poaching of talent is all too common in Canada’s largest cities, driving up salaries, and increasing training and business costs. While top talent is looking at other jurisdictions to build their careers, companies are increasingly looking for smaller cities in which to grow sustainably. Companies in these large cities are facing a new business imperative to reduce burnout rates, increase retention, extend job tenure, and improve quality of life for their talent. Our city is well-placed to attract talent and companies from all over the world, thanks to our affordable cost of living and multi-industry opportunities. Winnipeg is increasingly being seen as a smart place to do business and invest, thanks to our unique combination of work-life balance, affordability, and a diversified economy. Business succeeds in Winnipeg. The city has a longstanding economic base in several industry sectors including agribusiness, advanced manufacturing, information and communications technology, and transportation and distribution, among others. These industries have created a highly diversified economy, leading to market stability and a reliable talent pool for jobs of all skill levels. This is reflected in part through the companies that have decided to headquarter their businesses here: Winnipeg has the third-highest number of head offices per 100,000 population in Canada. Winnipeg is already proving itself to be a centre for new business opportunities. With the legalization of cannabis across Canada, multiple cultivation facilities and dispensaries have chosen to make Winnipeg their home base, taking advantage of the city’s reputation as a transportation and distribution hub, available and affordable real estate, low utility rates, and a strong talent pool for plant science. Low utility rates also make the city a natural fit for technology companies with high server and database requirements. Established industries such as advanced manufacturing and agribusiness continue to grow in Winnipeg, with a particular focus on incorporating new technology applications into these traditional business models. What is it about Winnipeg that has companies looking at the city as a prime opportunity for investment and growth? Among many other advantages, the city boasts some of the best affordability rates in North America, an extremely favourable geographic location, a skilled local talent base, and a uniquely collaborative private sector. Together, these attributes elevate Winnipeg into one of the continent’s best places to locate a business. Winnipeg shines well above other Canadian jurisdictions on multiple indicators, all of which demonstrate why it’s easier to do business, live, and raise a family in Winnipeg than any other major Canadian city. Winnipeg shines well above other Canadian jurisdictions on multiple indicators, all of which demonstrate why it’s easier to do business, live, and raise a family in Winnipeg than any other major Canadian city. 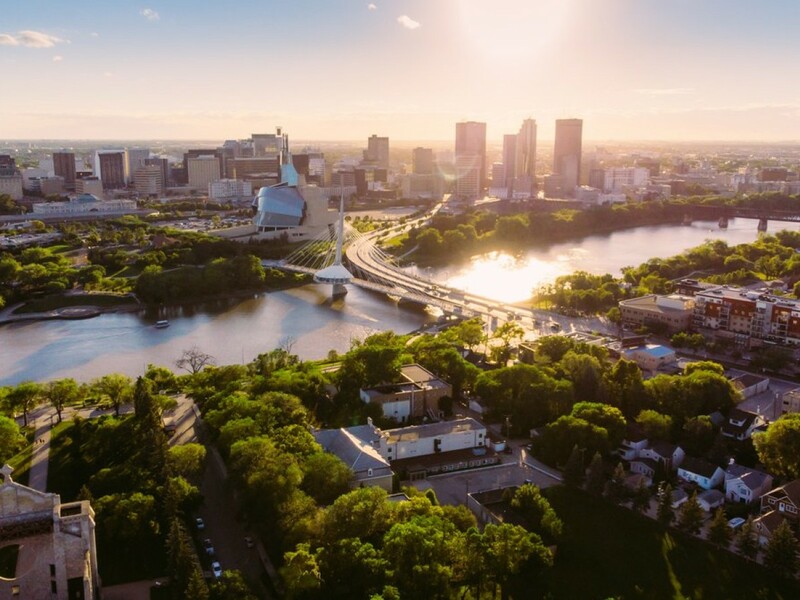 With the need for a physical office presence decreasing in relevance in a technology-driven world, Winnipeg’s competitive advantages are increasingly valuable to businesses. Suddenly, our city’s exemplary work-life balance, short commute times, and affordable real estate are accessible to more companies. Businesses looking at Winnipeg are increasingly realizing that their employees can experience job-life satisfaction in an affordable, culturally diverse environment that is also great for the company’s bottom line. Being located in the heart of North America means Winnipeg is well-positioned for both export to global markets, and intracontinental distribution and e-commerce order fulfillment. Located only 100 kilometres away from the fourth largest Canada/U.S. border crossing, Winnipeg is connected to the Mid-Continent Trade and Transportation Corridor, providing access to a seamless transportation system that extends from Canada to Mexico. Being in the centre of this Corridor provides an advantage to Winnipeg companies looking to ship goods across the continent, as evidenced by the over $25 billion in annual two-way trade between Manitoba and the U.S. in 2017. Whether through fibre-optics, air, road, or rail – there are numerous ways to get goods and services from Winnipeg to the world. Winnipeg is also home to CentrePort Canada, North America’s largest inland port and Canada’s first dedicated foreign trade zone. This tri-modal inland port includes access to three Class 1 rail carriers, a “5 minutes to 55mph” trucking expressway, and proximity to Canada’s busiest cargo airport with the most dedicated freighter flights. When it comes to getting goods to market quickly across North America, CentrePort Canada provides a compelling solution that businesses can leverage for investment, warehousing, and as a centre for e-commerce distribution and order fulfillment as they scale up their North American operations. Research and innovation is readily accessible in Winnipeg, creating opportunities for businesses to advance product development across all industries. Canada’s only Level 4 bio-containment laboratory is located in Winnipeg, while 40 additional research and development institutions across various sectors are doing cutting-edge research in a variety of fields. Construction is underway at Red River College’s Innovation Centre, which will house programs including business and applied technology, an applied computer education project space, and language training centre. Meanwhile, the University of Manitoba’s $500 million capital campaign will revitalize its campuses while simultaneously improving student experience and research excellence, including its cutting-edge Smartpark innovation hub. The city’s labour pool provides competitive advantages for business from around the world. Over the past five years, the city’s labour force grew by 6.1% - nearly two points higher than the national average. And, with over 100 languages spoken, Winnipeg is one of Canada’s most multicultural cities, offering global companies access to a linguistic and cultural talent pool that meets their needs. Nearly 200,000 international immigrants have moved to Manitoba since the year 2000, which been a large factor in the population of Winnipeg increasing to approximately 749,500 today. These immigrants are also putting down roots: the immigrant retention rate in Manitoba is over 80%. When it comes to access to talent, Winnipeg has the people, relationships, and linguistic capability to help businesses compete globally. Another business advantage of Winnipeg’s labour market is its long-term career viability. The province’s population was the 3rd youngest by median age in the country, thanks to an influx of international immigration and a young Indigenous workforce. That population growth shows no sign of slowing down, as Manitoba’s population growth estimates are forecasted to grow at a rate of 15% - second-best among all Canadian provinces. Companies looking for employees know that they have access to a reliable stream of young talent for decades. Employers looking at Winnipeg as a talent hub are increasingly seeing how well-connected the city is to global markets. With new technology applications such as remote work and strong fibre-optic data connections, companies can be based anywhere in the world and still collaborate closely between offices, while serving a global customer base. Companies wanting to do business in China, India, Brazil, or any other country worldwide can now look at cities such as Winnipeg as a base for their business. Winnipeg is resourceful. Traditionally, the city has had to take matters into its own hands to grow its private industry, culture, or economic potential. Our city’s geographic isolation from other large centres meant the city has had to develop self-reliance and punch above its own weight, for business and lifestyle alike. Now, these investments, resiliency and business culture are starting to yield dividends, leveraged by a business community that works together like few others anywhere else in the world. The spirit of community investment and support for the collective has been one of Winnipeg’s historic strengths. Winnipeg is often referred to as a large city with small-town feel; that culture has created a tight-knit and mutually supportive business community. This spirit has not faded away, and has turned into a strategic advantage for the city. Today, the city’s private sector works through YES! Winnipeg to compete for outside investment opportunities, creating a platform to compete against larger jurisdictions that have no ability to organize themselves to this degree. The small-town feel of Winnipeg has created a competitive edge, and a point of pride for business leaders who enthusiastically promote their hometown to their colleagues around the world. Winnipeg’s civic pride can be wielded as a promotional tool. Unlike larger centres, Winnipeg isn’t a major hub for international connecting flights, meaning people won’t get a chance to discover the city unless they are given reason to do so. This is where Winnipeg gets creative. Economic Development Winnipeg uses its gold-standard Bring it Home Program to work with local business leaders as champions to attract large business events and conventions to the city. The Bring it Home program helps to put Winnipeg on the map for these events, bringing senior executives, multinational company sponsors, and top R&D minds into our jurisdiction for multi-day meetings – and allowing YES! Winnipeg to showcase the city’s assets for investment and talent attraction. By creating a reason to visit Winnipeg, the Bring it Home program is a valuable tool that supports economic growth in an unconventional way and helps us showcase Winnipeg to the world. Today, Winnipeg is a vibrant community of business, artistic, and community development, which competes with major metropolitan areas from across North America. Affordability, collaboration, a strong and diverse industry base, and a multicultural talent pool all have businesses considering Winnipeg at a premier jurisdiction for business growth. With more people talking about the city than ever before, YES! Winnipeg is ready to help businesses succeed in growing, expanding, or relocating to the city. The message being shared at an international scale is emphatic: if you want to grow your business while enjoying a high quality of life and affordable cost of doing business, come to Winnipeg.